An entrance will be conducted in order to get admission in M.Sc. Program. You may have the application form from the GIPE official website or the direct link that we will mention in this notification for the application form. The Course is oriented towards fulfilling three primary objectives. First, equipping students with a firm grounding in core economic theory. Second, introducing them to various applications of economic theory in the real world. Third, developing a quantitative and analytical bent of mind. Interested candidates may apply for the admission in M.Sc. Post-Graduate Program when the application will be available. The total number of students to be admitted to the above Programs will be 40 each. The allocation of seats shall be as per Govt. of India guidelines with 50.5% of the seats in the open merit category and the rest in the reserved category. Admission to M.Sc. Economics, M.Sc. Financial Economics, M.Sc. Agribusiness Economics and M.Sc. International Business Economics & Finance is open to all graduate’s subject to minimum 50% marks in the aggregate (45% for reserved category candidates) at graduation. The Entrance Examination for admission to our M.Sc. program will be held on Sunday, 09th June 2019, from 10.00 a.m. to 12.00 p.m. The medium of the Entrance Examination will be English. The Entrance Exam will be of 120 minutes duration and will consist of 100 objective type questions, each carrying one mark. One fourth of the marks will be deducted as negative marks for wrong answers. The Application Form for GIPE Entrance Test for M.Sc. Programs is available online on the website of GIPE (www.gipe.ac.in). It is advised to that candidates shall apply before the due date to avoid the last minutes rush. Fee of Rs.2500/- (Rs.1250/- for Reserved Category candidates domiciled in Maharashtra, for M.Sc. 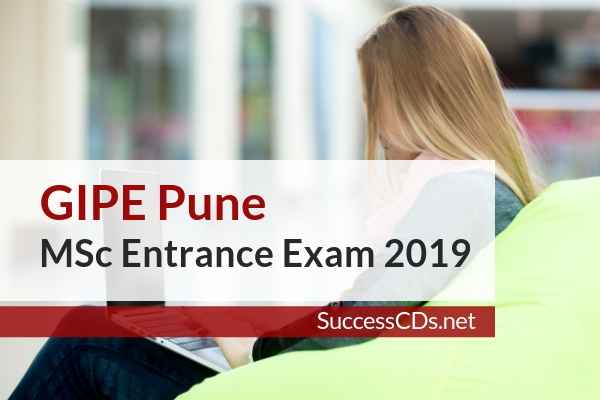 Economics only) payable by DD in favour of Gokhale Institute of Politics and Economics, payable at Pune and other required documents to "The Registrar, Gokhale Institute of Politics and Economics, 846, Shivaji Nagar, Pune-411004 (Maharashtra)"
Date of Exam M.Sc. Program will be held on Sunday, 09th June 2019, from 10.00 a.m. to 12.00 p.m.